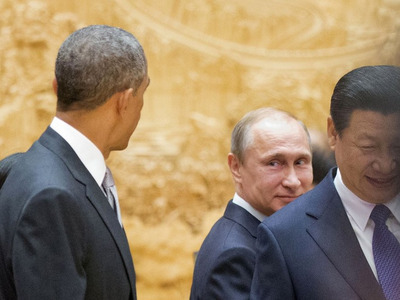 BEIJING – A couple of brief encounters between Barack Obama and Vladimir Putin during an Asia-Pacific summit in China on Tuesday spoke volumes about the chilly state of relations between the United States and Russia. With the two men crossing paths twice this week, first in Beijing and later at a G20 summit in Brisbane, Australia, there was little chance they could avoid interacting on the international stage — and with the eyes of the world press and fellow leaders upon them. Obama and Putin have never had anything close to personal chemistry, and with tensions high especially over Russia’s role in the conflict in Ukraine, there was little warmth on display in their informal contacts at the Asia Pacific Economic Cooperation (APEC) forum. When the summit opened in a sprawling convention center at a lake outside Beijing, Chinese President Xi Jinping walked in with Obama and Putin, both unsmiling, on either side of him. “It’s beautiful, isn’t it?” Putin was overheard saying in English in Obama’s general direction, referring to the ornate conference room. “Yes,” Obama replied, coldly, according to journalists who witnessed the scene. The three leaders stopped at Xi’s seat at the table. Putin reached out and clapped Obama on the shoulder. Obama barely responded. The two then took their seat to Xi’s left and right. The two had already spoken briefly on the sidelines of APEC at Monday night’s welcoming events, with officials on both sides saying they did not delve into issues that divide them. “They spoke briefly several times today,” Kremlin spokesman Dmitry Peskov said. A U.S. official confirmed that discussions had taken place but, like Peskov, offered no details. The two leaders would seem to have much to discuss but little chance of finding common ground. In addition to Ukraine, they are deeply at odds over Russia’s backing for Syrian President Bashar al-Assad. Communicating mostly by telephone over the past year, their contacts have been described as frustratingly tense as relations between Washington and Moscow have fallen to a post-Cold War low. Obama has insisted that Russia stop supporting pro-Russian separatists in eastern Ukraine while Putin has dismissed the sanctions that the United States and the European Union have slapped on Moscow as counterproductive. Obama’s deputy national security adviser, Ben Rhodes, told reporters in Beijing on Tuesday that any encounter would be a chance for Obama to remind the Russian leader of his promise to help resolve the Ukraine crisis peacefully. “President Putin knows full well where we stand,” Rhodes said. The two leaders last held brief informal talks on the sidelines of D-Day anniversary celebrations in Normandy, France in June. The senior U.S. official said there were still no plans for formal face-to-face talks between Obama and Putin at APEC or the G20 summit later this week in Brisbane. Meanwhile, scrutinizing body language between the two has become something of a pastime in diplomatic circles. The contrast in their personal styles, Putin brash and macho, Obama detached and professorial, was also on display at APEC. At a tree-planting ceremony at the summit venue, Putin swaggered up, chest out, and shoveled his pile of dirt. Obama walked up with his hands clasped behind his back, picked up the shovel, grinning slightly, and piled mud on his tree, according to a pool report of the event.